Google released new revamped publisher toolbar with new user interface with blocking capabilities, new feedback box and pop-up account overview. 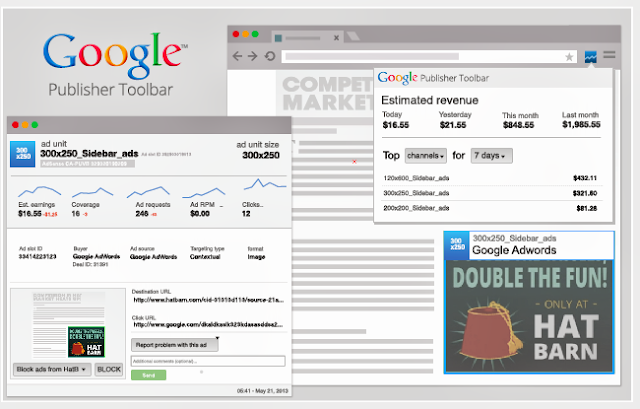 The Publisher toolbar is a Chrome extension allows users to know their Adsense earnings, performances and other basic information about Adsense from anywhere on the web without going to google.com/adsense. "Pop-up account overview: Giving you quick access to your estimated account earnings summary for today, yesterday, this month and last month as well as information on your top 5 channels or sites by revenue over a variety of date ranges. Ad Details: Giving you detailed information and full insight into a specific impression including buyer and advertiser details, the creative associated with the current view and now includes the ability to block the ad by buyer. Download latest version Google Publisher toolbar from webstore, if you are already using Publisher toolbar on your Chrome it will automatically updated to new version with above features.